Sometimes, it takes a village to ensure that children are cared for. Not so long ago, Michele Thomason, 44, didn’t need help. She provided for her children with a steady, good-paying job as a clerk at a gas station. After long days spent at the hospital, Michele Thomason often sits on her porch in Central City watching her three young children ride bicycles up and down the sidewalk. The family is thriving, thanks to the UNITY collaborative. Then, one day, Thomason collapsed at work. An ambulance took her to a New Orleans hospital, where she stayed for 15 days, undergoing a battery of tests. Doctors found that she had developed chronic myeloid leukemia. To help her out, an older son who worked offshore took in her teenage son, Davon, then 16. At first, she and her three younger children bounced from house to house, staying with family and friends. Then they found a family room at the New Orleans Women and Children’s Shelter, funded with support from UNITY of Greater New Orleans. UNITY, a 25-year-old nonprofit, leads efforts to reduce homelessness in our community. Thomason threw herself into her chemotherapy treatments, but still held a regular housecleaning job at a local hotel, where she worked shifts despite nausea and severe bone pain. 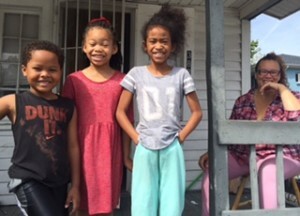 Last year, UNITY coordinated the family’s move from the shelter to an apartment in Central City with the help of Catholic Charities, another one of the 60 organizations that make up the UNITY collaborative. Then came news worse than cancer. While walking along Bayou Lafourche with friends, Davon — who couldn’t swim — somehow ended up in the water and drowned. Overcome with grief, Thomason added psychiatric appointments to her clinic and physical-therapy schedule. Her 8-year-old daughter McCaylah, who was closest to Davon, may have struggled the most. A talented artist, McCaylah regularly colors small pictures and rows of hearts for him on the cardboard box next to the couch that holds Davon’s ashes. Through all of their trials, UNITY and its member organizations have held the family close, coordinating an array of services from several of our member agencies, including Goodwill Industries and Volunteers of America. Working with our partners, we will make sure that this family gets the long-term rent assistance and supportive services that they need. We have seen how powerful it can be when a village works together to care for our community’s children. During the past year, UNITY and our partners have moved hundreds of families and individuals from the streets and shelters into their own apartments. During the past year, UNITY has coordinated the daily work that has reduced the average length of time children spend homeless in our community from six months to only 41 days. We need to do even more – and we will! This year, the UNITY collaborative will house even more children and adults, with your help. Thank you for your generosity and compassion! P.S. You can be part of something big, to make our community better for everyone! Your gift will help us meet our GiveNOLA Day goal, of raising $30,000 to move at least 350 of the most vulnerable children and adults out of homelessness into housing this year! GiveNOLA gifts also receive matching gifts and prizes, thanks to the Greater New Orleans Foundation.